It is said that Greece is one of the few countries which gives one the key to ‘self discovery’. Beyond a shade of a doubt, Corfu can be said to be an island whose multicultural identity is rooted in a mythical past that crams with historical events: the archaeological positioning of the castles interposed between strategic locations across the island send one back to the turbulent past laden with battles, led by a small but brave people defending their identity against those who had claimed it. The history of the region has been a very controversial one because of the continuous succession of foreign rulers in Corfu. All throughout the centuries, the Romans, the Venetians, the French and the English, all have been trying to conquer this island. Remarkable palaces, amazing fortresses, museums, libraries, elegant hotels and old churches are open to visitors and holiday makers all over the world. All stand against a breathtaking background of lush vegetation and olive plantations that combine in an unexpected puzzle that meets the hungry eye of the visitor, leaving it up to them to unjumble the pieces. Should you make up your mind to visiting Corfu, get ready for the trip of your life. Free yourself of any inhibitions and sink into the comforting Mediterranean weather with mild winters and refreshing summers. Do start your imaginary exploration of the past with the Palace built by Empress Elisabeth of Austria and roll the dices of fortune into the casino built on the ruins of the past. Twenty five minutes at sea is all that stands between you and the island of Mourtos, the historical place where the Greek fleet hid during the Second World War. And if you’ve found yourself daydreaming while impersonating the characters of ‘The Blue Lagoon’, then, this is your chance to make your dreams come true and play the part of your life. If you want to spend quality time with your children or you simply want to bring out the child in you, know that a place like Aqualand – one of the largest aquatic parks in the SE of Europe, waits for you with unforeseen surprises: wide-ranging water slides and blue pools are the only thing setting you apart from yourself and the child in you. When you feel drained of the very last drop of energy, take time to stop for a bite in one of the many traditional taverns waiting for you to spoil your senses. Feel and enjoy the multitude of tastes awoken by the godlike drinks and traditional foods, sing, dance and live like the Gods did thousands of years ago. Once that you’re batteries are recharged, you can set off on a new tour of the island and let yourself driven around by the unbeatable rhythm of sirtaki and zorba. If you like living your life to the full, then you should know about Pink Palace and the toga parties held on the island – a real multicultural opportunity for you to socialize with other holiday-makers or with the local people here. If you’ve planned your trip just for a few days, then you should think again and make a stop at Palladium Night Club. A holiday in Corfu is undoubtedly a new opportunity for you to improve your knowledge on yet another cultural and historical Europe. The fashionable clothing items, the remarkable handmade souvenirs or the unique and classy style of the leather and olive jewelery will be the hard evidence proving that your trip was imaginary but real, making your holiday all the more wonderful and unforgettable. 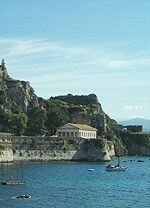 Sissy’s Achillion Palace is one of the main tourist attractions on Corfu Island. Built by an Italian architect upon the command of Empress Sissy in 1890. Kavos is one of the most famous tourist resorts in Corfu. It is dominated by british youth who come for nightlife, clubs and entertainment at Kavos.